Durham NH- 382 is back for another year and with some serious upgrades. Saturday March 29 we have added a new contest, March Mayhem. Inspired by the NCAA b ball tournament, 64 skiers (first come, first serve) will be randomly seated head to head in single elimination, bracket style competition. Bring your slopestyle A game, your only guaranteed one run and there is a grand on the line...winner take all. 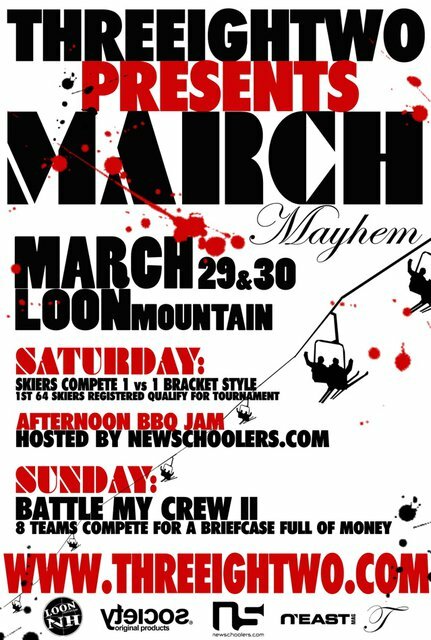 After all is said and done well be BBQing while our friends at Newschoolers.com host an open jam, come eat, ski, film and chill with us. -4 riders in video must be the same riders you are planning on sending. -Video submissions must be recieved by March 1, 2008. -Check in for invited crews begins at 8 am. Check out http://www.threeightwo.com for ALL the details.